TOKYO (AP) — Hiroo Onoda, the last Japanese imperial soldier to emerge from hiding in a jungle in the Philippines and surrender, 29 years after the end of World War II, has died. He was 91. Originally, 引き揚げ (hi-ki a-ge, recovery) refers to the repatriation of Japanese civilians and non-combatant Japanese soldiers (with the ranks of 軍属 and 軍夫) after WW2 from occupied territories including China, Korea, Russia (also 樺太島, the Sakhalin Island, or 庫頁島 in Chinese), Southeast Asia, and of course, Taiwan. For the combatants (軍人), it was 復員 (fuku-in, to re-group); and for the IJN, 解員 (kai-in, to disband). More recently, however, 引揚 is taken to mean the repatriation of all Japanese. By 1946, around 90% were already shipped back to Japan (left: children on board a hi-ki a-ge ship). Those marooned in North Korea, and those who were sent by the Soviets from Manshu (滿洲, Manchuria, 東北Northeast China) to labor camps in Siberia as POWs all had a much longer delay going home and endured much harsher conditions than the rest. And then there were the forgotten ones. An example: some of the thousands of abandoned children raised by Chinese (and a few Russian) foster parents, known as 中国残留日本人孤児, were repatriated, starting in 1965 when they were discovered by reporters visiting from Japan. And sighting of Japanese military hold-outs in SE Asia is still being reported today; although 中村輝夫Nakamura Teruo (李光輝, a Taiwanese drafted in 1943) and 小野田寛郎Onoda Hiro (drafted to serve in 1941), both of whom finally surrendered and returned to Japan in 1974 from Indonesia and the Philippines, respectively, maybe the last ones. 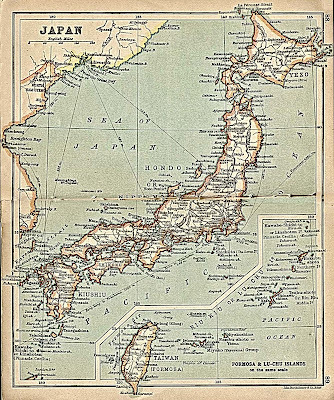 Organized Japanese emigration actually started during the Meiji Era when the increase in population could no longer be supported by the agriculture. Some emigrated overseas to Hawaii and the Americas. 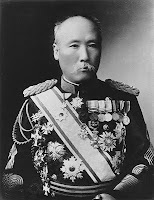 The dominating military decided, however, that the most expedient way to resolving this issue was to grab lands off the neighboring Korea and China and send the Japanese there. And as they say: the rest is history. The first Japanese immigrants of 133 families (385 members) arrived in Taiwan in 1899, organized by a private 賀田Kata company. They settled in Hua-lien area in a brand new village named 賀田村 (the village is still there today under the same name). This first attempt did not fare too well, though. The immigrants were allowed contractually to grow only sugarcane, not staple food. Plus eastern Taiwan was not exactly a hospitable place. There were the hostile Aborigines and malaria to contend with. 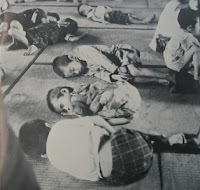 Some died from diseases and many moved out or went back to Japan. The pace quickened somewhat in 1909-18 after the Governor General of Taiwan had instituted a new policy that offered free land use plus 3 years of free medicine. Home construction, health care, and purchase of agricultural equipment were all subsidized. More than 1,700 immigrated and settled in Hua-lien and Tai-tung areas. Between 1917-24, private enterprises then took over and recruited more immigrants from 四國Shi-koku and 九州Kyu-shu. They were again all sugarcane farmers. By 1932, the settlement sites had shifted to western Taiwan in the dry river beds in the southern plains of Taichung, Tainan, and Kaohsiung. In addition to sugarcane, the farmers were now permitted to grow rice and other crops to become self-sufficient. The tillable lands were divided into large squares and each village was completed with irrigation canals, levees, roads, and drinking water supply. About 4 hectares of land was allotted to each family; however, no land ownership was ever granted. And the total population of these farmers was around 50,000. This farmer immigration into Taiwan was hardly a success; although the Japanese Government has thus far remained reticent on this issue. The farmers were only a small portion of the approximately 1/2 million (to be exact: 479,544) Japanese repatriated form Taiwan in 1946. Most Japanese immigrants at that time were not farmers. Instead, they occupied a higher niche, not only as the ruling class, but in a modernizing society, they were also administrators, businessmen, teachers, physicians, engineers, artists, musicians, students, military, and (the much feared) policemen. Most migrated to Taiwan on free will and stayed in metropolitan areas and small population centers (e.g., Danshui). And undeniably, gratuitous superiority complex sometimes did raise its ugly head. In March, 1946, the repatriation process started (right: repatriates on a 引揚 ship). The Japanese were ordered to fill out various forms, hand over their properties item by item, and be certified (see certificate above). And each person was allowed to carry 1,000 Japanese yen in cash, one set each of summer and winter clothing, and one set of futon before boarding the hi-ki a-ge ships. Some had entrusted valuables to their Taiwanese friends and come back to retrieve them years later. With the meager possession, they returned to a bombed out Japan facing a bleak future. Some refused governmental assistance out of shame/pride and died in the winter cold. Most, however, had stuck it out and re-started their lives. Among the better known are, for example, industrialist 林虎彦Hayashi Torahiko (born 1926, Kaohsiung) and Senator 浜四津敏子Hamayotsu Toshiko (born 1945, Taipei). Around 30,000 were allowed or asked to stay until 1948/9, most of them technicians and engineers needed for the infrastructure. And a few were scholars and university professors. An estimated 10,000 went underground, through marriages to Taiwanese husbands (some at the last minute) - never to re-surface as Japanese again. We remember one of these women living in Danshui as a shopkeeper who spoke Japanese-Hoklo to the great puzzlement of little kids. And one of the few professors was 高坂知武Takasaka Tomotake (1901-1997) of National Taiwan University. He arrived in Taiwan an assistant professor in 1930, retired as Professor Emeritus and returned to Japan in 1987. He was a noted agricultural engineer/educator and an accomplished musician. He also founded the Imperial Taihoku University Symphony Orchestra which is now the NTU Symphony Orchestra. A building on NTU campus, the 知武館, was dedicated in 1989 in his honor. The coldest spot in Taiwan? Why, Danshui of course. of this floating world, swept"
After the loss of Keelung, Danshui was the only remaining port accessible to the Qing soldiers in northern Taiwan. 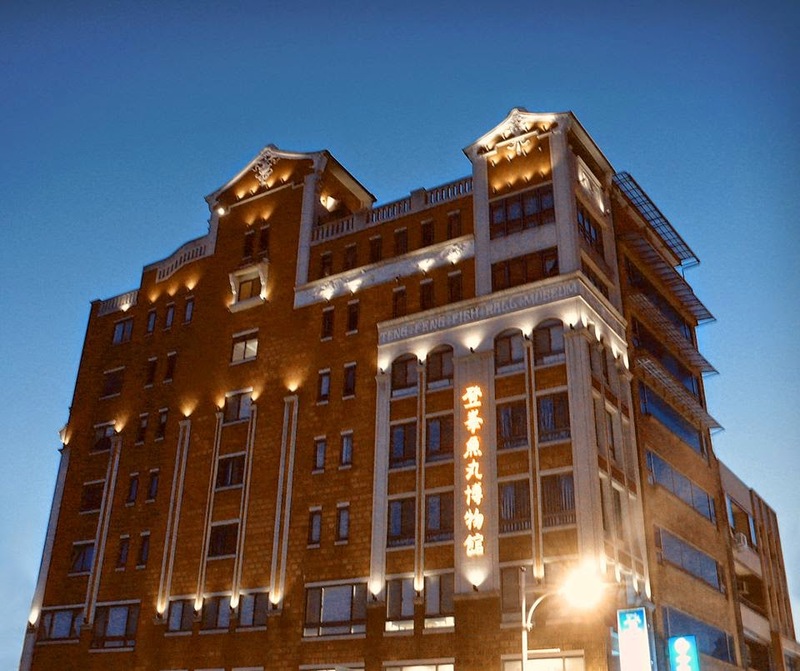 They managed to arrive by following either the coastal roads from Keelung by way of 金山Gin-Shan, or the railroad tracks from Keelung to Taipei and then traveled along the northern shore of Danshui River. By early June, 1895, about 5,000 men (?) waited impatiently on the shipping docks in front of the 媽祖宮MaZu Temple hoping to catch a boat ride back home to China. At that time, there were supposedly still 300+ battalions (360 men in each battalion) of Qing soldiers on the island ready to fight. However, it is known that the Chinese officials often inflated the number of enlistees and pocketed the pay of the ghost soldiers. So the true strength remains unknown. Most of the soldiers who ended up in Danshui were from Canton previously brought over by 唐景崧Tang Jing-Song to fortify the defense of Taiwan. They owed no loyalty to the people of Taiwan and in fact ran away en masse at the first sight of the Japanese Forces. In retreat, they wrecked havoc wherever they went. The looting and killing in Taipei had prompted the merchants, both Taiwanese and European, to seek Japanese intervention. (Needless to say, these merchants are now branded as traitors of China.) On June 7, the Japanese cavalry pretty much trotted into Taipei unmolested. In so doing, they had also underestimated the resolve and the fighting capabilities of Taiwanese resistance south of Taipei and later paid for this oversight dearly. June 5: Chinese merchant ship 駕時(the Cass) took a number of the soldiers back to Shanghai. June 10: At 8:30PM, 1,200 boarded the Japanese ship 磯浦丸(? - might have been the 有磯浦丸 owned by 南嶋間作) which sailed for Hong Kong. 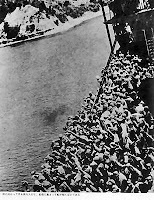 June 11: The remaining 1,700 were put on board of the Chinese ship 萬國號 and arrived back in Amoy. June 9: Sent back 1,000+ Qing soldiers whose luggage was inspected by the military police and then allowed on board a British ship which then sailed for China. A hectic day with no time for meals. From early afternoon to dusk, representatives from several villages came to request protection from pillaging by the Qing soldiers. June 10: Announced the exchange rate of Japanese and Qing monies. Hired 36 locals to do a census survey and purchase foodstuff plus cleaning and cooking. There was a report of a 14-men gang robbing 新莊Shin-Juang. Dispatched one military police with 11 soldiers to catch these bandits who ran off upon learning the impending confrontation. June 12: Reported to the headquarters that 1,700 Qing soldiers were sent back to China yesterday. Decided to distribute rice to the local poor. June 15: Announced the hygiene law. There was a one-day delay for a British ship to take on some Qing soldiers who were therefore given a one-day's ration. They were quite uncouth leaving filth and garbage scattering on the docks, had to force them to clean up at gun point. Census showed 1,019 families residing in Danshui. June 16: The patrol found one dead Qing soldier, had to force 5 surprisingly unsympathetic others to bury their comrade. Distributed 308 boarding passes. In the afternoon, sent back 350 Qing soldiers. Paid 15 local laborers and 10 carpenters. June 19: To speed up the repatriation process, negotiated with 3 Chinese ships, one could take 60 to 溫州Wen-Zhou, and the other two, 136 and 62, respectively. Finally, the repatriation was finished. Caught two escapees, a 44 year old tailor from 江西Jian-Xi and a 20-year old peasant. The Japanese version is probably closer to the truth. The Chinese version argued for 2,000 massacred based on conjecture and an unsubstantiated estimate of 5,000 at the beginning. For one thing, the many westerners in town (including Dr George Leslie Mackay) would have taken notice as they had done during the Sino-French War and reported any large-scale killings to the outside world - not to mention the logistics needed for the burial of 2,000 that Danshui certainly did not have. [Note: JW Davidson's 1903 eyewitness account also did not report such an incident.] The Japanese house-keeping log indicated that in 10 days, around 3,300 Qing soldiers were repatriated. It was probably close to this number, not 5,000, who had arrived in Danshui. Fukushima also had written to the Chinese Government in Canton requesting humane treatment of these returning poor souls. These poor souls came back 50 years later to re-claim the island. On Oct 8, 1945, the 9th Company (106 men) of the 4th Regiment of KMT Military Police (國軍憲兵第四團) arrived in Danshui on junks. They were called 雨傘兵 (the umbrella troop), disappointingly, by the welcoming residents of Danshui. Because, for some inexplicable reason, most soldiers carried on their backs a folded umbrella (on top of the pots and pans plus some rifles and bags of rice that they were also carrying). Yes, the rag-tag army had just landed. And Danshui-ren were stunned by their disheveled appearance not knowing that these soldiers had gone through hell before arriving in Danshui - not until recently anyway. A postscript: In the 228 Incident of 1947, all three battalions (with the 2nd Battalion joining in from Foochow) of the 4th MP Regiment played a brutal role in northern Taiwan. Eventually, after about 5-6 months, the resistance in Taiwan gradually subsided (but never totally stopped). There had been no support from China and none was forthcoming, either. Tang Jing-Song (left, the "10-day President") lived out his life in luxury. He was the biggest patron of the Guang-Xi opera and in his spare time wrote poetry. And yet, he is now enshrined in 淡水忠烈祠 - for reasons still unknown. The only achievement that the Danshui-ren know of was his successful escape back to China. Even the shots fired at Arthur from the stranded Qing soldiers had failed to stop him. It is said (of Tang) that "英雄懦夫僅是一念之差而已 (the difference between a hero and a coward is only a mere change of heart)" - a very accurate description indeed. There was more. According to 連橫Lien Heng's 台灣通史Comprehensive Taiwan History: ...「李文魁馳入撫署請見，大呼曰：『獅球嶺亡在旦夕，非大帥督戰，諸將不用命』。景崧見其來，悚然立；而文魁已至屏前。 即舉案上令架擲地曰：『軍令俱在，好自為之』。文魁側其首以拾，則景崧已不見矣。景崧既入內，攜巡撫印，奔滬尾，乘德商輪船逃。砲台擊之，不中。文魁亦躡景崧後至廈門，謀刺之。事洩，為清吏所捕，戮於市。」- A subordinate of Tang's, Commander Li Wen-Quei, who had just lost Keelung to the Japanese, barged into the President's Office in Taipei and pressed for Tang to personally lead the battle at Shi-chiu Ling, the gateway to Taipei. A terrified Tang did not want any part of it and merely threw down a rack of "Orders" and exclaimed "The military orders are all here, do your best!!" Li picked up the orders and saw from the corner of his eyes that Tang had already disappeared [onto Danshui and then Amoy...] Li later secretly followed Tang to Amoy and plotted to have Tang assassinated. He was caught and killed in public by Qing officials. And how did those stranded leader-less soldiers return to China? That is another story.